Our colleagues at IPC Media, Wallpaper* magazine, have awarded the Riva Aquariva by Gucci for its outstanding design in their 2011 Design Awards. The team at Wallpaper* may not award a boat for its fuel economy, storage in the cockpit or fiddled dinette table but they know a thing or two about exemplary design. 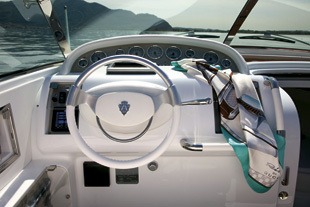 Of the Riva, Wallpaper*, who specialise in design, interiors, fashion, art and lifestyle, say: “Seemingly conceived for cutting across Lake Como or cruising Venetian canals, Riva’s chic Aquarama, Ariston or Tritone craft were once the summer plaything of choice for the likes of Sophia Loren, Anita Ekberg and Richard Burton. There is also a stunning video on the Wallpaper* website of the boat being built and tested – certainly worth a look to see one of the most glorious forms on the water in action.